We’d love your help. Let us know what’s wrong with this preview of The Memory of Lemon by Judith M. Fertig. To ask other readers questions about The Memory of Lemon, please sign up. Would you like to receive a downloadable booklet of colorful, lemony recipes to share with your book club as they read The Memory of Lemon? Or share with your family? Or keep all to yourself? You'll find the recipe for a pie that holds the key to the novel. Find Judith Fertig, Author on Facebook and let me know you're craving lemon. Valerie Jackson Loved the Cake Therapist. Looking forward to discovering more of her books. And, yes, lemon recipes are always wonderful. Neely is back, and her bakeshop is a pleasant, delicious, heartwarming way to spend an evening of reading. The smells, the visuals of the baked goods, and the taste of everything Ms. Fertig describes makes your mouth water. THE MEMORY OF LEMON begins with a difficult bride who can't decide on her wedding cake flavor and venue. Neely just can't "taste" her personality and choose the perfect flavor for the bride. There is something familiar for Neely about the venue the bride chooses, but she can't place it. 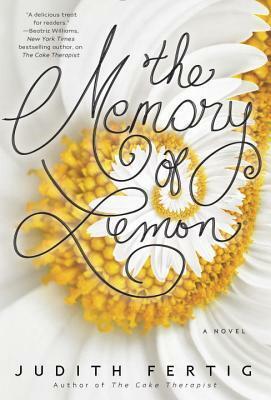 THE MEMORY OF LEMON has familiar characters and brings the warmth of the characters back as we share Neely's life as a baker who knows what flavor cake and icing you are, as a woman getting a divorce, as a woman who is in charge of carrying for her grandmother, as a woman whose father wants to reconnect after 20 years, and as a woman who wants to reconnect with her childhood sweetheart. I enjoyed reconnecting with the characters. The book can be read as a stand alone, though. THE MEMORY OF LEMON is another sweet read but also a read that has some not-so-sweet aspects for Neely. ENJOY when you read THE MEMORY OF LEMON. By Claire having the 'special gift' coming from her grandmother and father...the author gives the reader quite a interesting story that will keep your attention. I really enjoyed learning about herbs, lemons, scents, flavors and even especially those wonderful pies. There is way too much going on in this book. Jumping back centuries to decades to modern times to locations, and back again. I had no idea who these people were half the time, or what their big connection was supposed to be. The author should've kept the storyline in modern day, as that was the strongest part of this book, but even then, the characters were underdeveloped and fell flat. Pass on this one. I loved the Cake Therapist and was excited to read The Memory of Lemon from Judith Fertig. I loved how Neely's story intertwined from the present to the past and of course reading about all Neely's bakery goodies made my mouth water. Looking forward to reading Ms Fertigs next offering. Thanks to NetGallery for providing me with a copy of this great book. Claire "Neely" decided to move back home to start up a bakery after her NFL star husband had been unfaithful multiple times, so they separated and she went on to begin her bakery "Rainbow Cake." Neely's cakery has helped many brides because Neely has an ability to see snippets of her client's life and find the perfect flavor match up. These come to her in visions and helps her to read a person better to pinpoint what would suit them best. Except she's about to face a mother and daughter duo that Claire "Neely" decided to move back home to start up a bakery after her NFL star husband had been unfaithful multiple times, so they separated and she went on to begin her bakery "Rainbow Cake." Neely's cakery has helped many brides because Neely has an ability to see snippets of her client's life and find the perfect flavor match up. These come to her in visions and helps her to read a person better to pinpoint what would suit them best. Except she's about to face a mother and daughter duo that will prove quite difficult. Especially when Neely's ability seems to fail her. The characters are well developed and their stories are not forgotten because everyone's story is important and there is a reason behind them, which is what we learn, too. I was able to connect with all of them, the frustration, the sadness, and heartbreak. The Memory of Lemon returns readers to Rainbow Cake, the winsome bakery opened by Claire "Neely" Davis in Millcreek Valley, Ohio. Neely is an exceptional pastry chef; not only because of the results she can produce but also because of her remarkable flavor intuition. It's an ability that allows her to tap into the emotions of her clients, creating confections that are not only tempting and delicious but also personal and memorable. However, Neely may have met her match in Lydia and her mom, Cade The Memory of Lemon returns readers to Rainbow Cake, the winsome bakery opened by Claire "Neely" Davis in Millcreek Valley, Ohio. Neely is an exceptional pastry chef; not only because of the results she can produce but also because of her remarkable flavor intuition. It's an ability that allows her to tap into the emotions of her clients, creating confections that are not only tempting and delicious but also personal and memorable. However, Neely may have met her match in Lydia and her mom, Cadence. It seems as though the bride-to-be and her high-society mom are immune to every sweet offering Neely puts forth. But The Memory of Lemon is more than a story about a cake maker and her clients. It's also about Neely creating her own way forward after leaving her unfaithful husband, Luke. Neely dreams of a successful business, the ability to care for her grandmother, who is residing in a care facility, a new start for new love with an old flame, and the chance to reconnect with the father who left her life when she was a teenager. I adored this book. It was made up of so much I love about reading, I was so totally caught up in Neely's world and could see myself in the places she inhabited. I especially loved the food moments - the smells and tastes that transported Neely and I into another place and time. And I was such a fan of those "gifted" moments. I will admit to getting a little lost in the moments of the past and how they all connected to Neely but it ended in such a way that there was closure and it all made sense. I adored this book. It was made up of so much I love about reading, I was so totally caught up in Neely's world and could see myself in the places she inhabited. I especially loved the food moments - the smells and tastes that transported Neely and I into another place and time. And I was such a fan of those "gifted" moments. I will admit to getting a little lost in the moments of the past and how they all connected to Neely but it ended in such a way that there was closure and it all made sense. I definitely recommend this one. —The flashbacks were very confusing and I felt like she kept introducing random historical characters 3/4 of the way through the book. —The ending was so tidy and predictable and basically didn’t even have a conflict preceding it. Neely worked hard, things went well, all was beautiful, the end. No big reveal to link it all together, no mentioning to the bride she’d discovered their families were connected, really the only conflict was her over-anxious brain. —The main plot we were supposed to care about was the romance between Neely and high school friend Ben, but there was so little character development besides a few cliches Neely randomly thinks about him. We don’t know how or why she came to those thoughts, or really care by that point in the book. Most of their relationship in this book is just thoughts or assumptions by Neely, rather than scenes of interactions. This was a light read - another baking theme - which I seem to like even though baking or cooking are not on my list of favorite things to do.. just kind of had to go along with the characters having the ability to remember or assess a situation based on the flavor they 'tasted' when something happened.. Cute, easy read about a baker who is working on a challenging wedding while juggling a complicated love life and family issues. I was a bit lost when the timeline jumped around because it was sometimes difficult to remember all the characters and how they were related. It did tie up neatly and ended on a hopeful note. This book was fine, but nothing spectacular. There were so many characters that there didn't seem to be enough detail on any particular one. I did like the concept of using taste to unlock memories and the past, though. Meh...should've stayed with more of the magical realism and less reality. I liked this book and read the first half of it in a day. I sometimes found the going back and forth to learn about the histories a little confusing. I do like the present day characters and all of the descriptions of the pastries. Thank you to NetGalley and the publishers for the opportunity to read this book prior to release. Claire (who goes by Neely) has moved back home and has opened her dream bakery. She is no ordinary baker, her flavor combinations are nothing short of magical and she seems to have the uncanny ability to know exactly what flavor will touch her customer’s souls. She can “taste” the flavor of her customer to know what the right combination is for their baked delight. Neely has taken on a large hi Thank you to NetGalley and the publishers for the opportunity to read this book prior to release. Neely has taken on a large high-end wedding short notice and is having nothing but problems. She’s dealing with a free-spirited bride and her very overbearing mother. She can’t get a read on either one of them and is having a terrible time trying to help them choose the perfect wedding cake. To add to this, she’s going through a messy divorce, re-kindling an old romance and her absentee father has started mailing her again after nearly two decades. The story was well written and her interactions between the bride and her mother and all of the supporting cast was believable and genuine. Neely was a very solid character and you could easily feel a connection to her, as well as the other supporting characters in her life from Ben, her old flame to Maggie, her employee at the bakery. They are, for the most part, well-thought and well put together characters, ones you could see yourself running into if you visited her hometown. I wasn’t as much of a fan of the back and forth that the story took between Neely and back through her ancestry, showing where her gift of “taste” comes from. For me, it did take away from the story a little too much to be abruptly thrown back in time to a different person and place, seemingly at random and sometimes it didn’t seem to have a real connection with what was going on in Neely’s world. I also saw a few loose ends that never did get tied off and left me feeling a little unsatisfied. If the author is going to be doing a follow up book to this one, I guess it would make sense. If not, there are a few threads that could be snipped without doing any damage to the story. But I still liked the story and the characters and I am definitely going to pick up other works by Judith Fertig to see if there are more adventures with Neely and her wonderful gift. Clare “Neely” Davis is back in this second novel (stand-alone) with her delightful gift of sensing flavors of taste that match people’s predominant emotions. They flow freely and easily most of the time but not in this particular story as she attempts to plan a wedding cake for a mother and daughter at loggerheads over the final decision. The mother used to be poor and struggling but married a man with drive who created a business that has made them rich; Mrs. Stidham is determined never to retu Clare “Neely” Davis is back in this second novel (stand-alone) with her delightful gift of sensing flavors of taste that match people’s predominant emotions. They flow freely and easily most of the time but not in this particular story as she attempts to plan a wedding cake for a mother and daughter at loggerheads over the final decision. The mother used to be poor and struggling but married a man with drive who created a business that has made them rich; Mrs. Stidham is determined never to return to that hard, cold place and so her daughter, Lydia’s desire for a Kentucky hillbilly wedding is perceived by the mother as horrific. Neely knows there’s no happy in-between place here so decides to travel to Kentucky to see what she can sense there that can fill the gap for a wedding to please mother and daughter. The story then begins to flip back and forth between the past and present, albeit with too many confusing characters, as we enter another story that has shaped many lives but also been a source of healing that might just be connected to Neely’s past as well. Another story develops in a very graceful way that adds mystique and compassion to the story, that of Neely’s father, who had turned to drink and desertion after the Vietnam War and is now facing his own demons through the help of the Veterans Hospital. It’s a potent and poignant tale he gradually reveals through letters to Neely and she in turn must learn to deal with her own memories. Forgiveness isn’t easy but must be attempted by those who mature. Add another level of conflict with Neely’s problems divorcing her ex-husband who seems to enjoy the hold he has over her due to their pre-nuptial agreement. She could lose everything she has built in her business and so must deal with this annoying reality oh so carefully. At the same time her attraction to another man, Ben, just be put on hold until Neely is fully divorced. The question is whether or not Ben will wait for that finale. All in all, The Memory of Lemon… is a very nice read. Delightful and definitely recommended! I would like to thank Goodreads and Penguin Random House for the advance reading copy of this book in return for an honest review. I truly enjoyed this delightful, light read. The descriptions of food were lyrical. The offerings of Neely's (the main character) Rainbow Cake bakery made me want to visit and see the wonderous things the author described so beautifully. Neely is an engaging and gentle protagonist. As a reader, I knew I would like Neely and wished her the best. Yes, I know she's a fict I would like to thank Goodreads and Penguin Random House for the advance reading copy of this book in return for an honest review. Neely is an engaging and gentle protagonist. As a reader, I knew I would like Neely and wished her the best. Yes, I know she's a fictional character but I enjoy books with likable characters! The author told a lot of the story with flashbacks/visions of past times. I am not a big fan of this technique but it seemed to work fairly well in this novel. I felt the number of characters introduced through the visions was a bit ambitious. It is a relaxing, enjoyable read and I was fascinated with some of the background material especially about the spiceberries and scented geraniums and found myself investigating those topics through Google. This was an added and unexpected bonus. With all the delicious treats described, I had hoped for more than one recipe (and that was written in 1800's style). I can honestly and enthusiastically recommend this book if you like gentle, romance type stories. Thoroughly enjoyable book, exploring the memories that can be associated with taste and scent, and causing one to wonder if those memories can be handed down in our DNA. The characters in the book were (mostly) likable, and despite touching on some tough subjects, this primarily felt like a light-hearted read. Neely, the bakery owner, was especially appealing for me - sensitive and generous of spirit. The descriptions of her bakery and her relationship with her employees made the book for me. Hav Thoroughly enjoyable book, exploring the memories that can be associated with taste and scent, and causing one to wonder if those memories can be handed down in our DNA. The characters in the book were (mostly) likable, and despite touching on some tough subjects, this primarily felt like a light-hearted read. Having been married in a bakery myself, I loved the bakery setting, and the wedding planning. The slightly mystical overtones were well done. My rating would have been a full four if I didn't feel the description of the growing relationship with Ben was a little flat. *Edited to add: After writing my review here, I went to Judith Fertig's blog, and happened to find the post she'd labeled as a sneak peek of The Memory of Lemon. I have to say that her inspiration photos were almost exactly what I envisioned as I read the book, yet I don't remember the book having lengthy, elaborate descriptions of the setting. Well done. I received an ARC of this book from the publisher in exchange for my unbiased opinion. Claire "Neely" O'Neil has recently opened up a bakery in her hometown. She has a unique gift of being able to "taste" a flavor and pick the perfect cake for brides-to-be, often seeing a memory from the other person related to the flavor she tastes. However, with her latest bride-to-be, Lydia, Claire doesn't immediately taste a flavor and has to work to discover what this bride-to-be and her mom want. Flashbacks I received an ARC of this book from the publisher in exchange for my unbiased opinion. Claire "Neely" O'Neil has recently opened up a bakery in her hometown. She has a unique gift of being able to "taste" a flavor and pick the perfect cake for brides-to-be, often seeing a memory from the other person related to the flavor she tastes. However, with her latest bride-to-be, Lydia, Claire doesn't immediately taste a flavor and has to work to discover what this bride-to-be and her mom want. Flashbacks to Claire and Lydia's ancestors are woven throughout the story. There is also a side story about Claire trying to divorce her NFL quarterback husband, Luke, and start dating Ben, her friend since childhood. Neely is a gifted pastry chef. Not only can she tell which flavors a customer will like but she can tell what they need. She can sense their history – going back generations. I loved that aspect of the novel. It made me think about my ancestors and their life experiences and how everything led to where I am now. Neely has turmoil in her life. She’s waiting for her soon-to-be ex husband to sign the divorce papers so she can move on with her life (hopefully with a certain man from her past). She al Neely is a gifted pastry chef. Not only can she tell which flavors a customer will like but she can tell what they need. She can sense their history – going back generations. I loved that aspect of the novel. It made me think about my ancestors and their life experiences and how everything led to where I am now. 3.5 stars Fertig’s follow-up to The Cake Therapist allows readers to experience the process Neely goes through to discover long-buried secrets about her past. Through different scents and flavors, emotions are intertwined with memories as Neely uses them to help herself and others heal and move forward to a brighter future. This is a deeply meaningful story that will allow readers to examine their own lives as well. As Claire “Neely” Davis prepares for another wedding, she finds that her gift for 3.5 stars Fertig’s follow-up to The Cake Therapist allows readers to experience the process Neely goes through to discover long-buried secrets about her past. Through different scents and flavors, emotions are intertwined with memories as Neely uses them to help herself and others heal and move forward to a brighter future. This is a deeply meaningful story that will allow readers to examine their own lives as well. As Claire “Neely” Davis prepares for another wedding, she finds that her gift for choosing the perfect flavors seems to be absent with this particular bride. Neely’s own life is in a bit of turmoil: Her divorce is not proceeding smoothly; in fact, Luke is putting up immense obstacles. Neely’s long-estranged father gets in touch, and as the two communicate, memories of the past come to the surface and allow Neely to get a better perspective on the present. I absolutely adored The Cake Therapist by Judith Fertig, and was incredibly excited to read her next offering. While we once again follow pastry chef Neely – who has the special gift of “tasting” people’s emotions – she is now in a very different place in her life. Trying to divorce her cheating husband, find happiness once again in her own love life, deal with the delicate issue of her father, and of course, pleasing brides, it was a joy to catch back up with a very relatable character. Typically I am a big fan of books that features glimpses into the past, but actually with this one I preferred to keep reading Neely’s story, and the flashbacks –though I most certainly understand why they were featured – made the story lag just a smidge for me. But other than that small fact, I highly enjoyed this comforting novel and hope for more from Judith Fertig. I like a book that’s fun to read and that engages your senses, and involves your emotions and your intellect. I like a book that presents interesting characters and slides in fascinating information, so I’m learning delicious little tidbits just by reading. And I like a dash of romance and a wisp of mysticism. Judith Fertig manages to provide all those elements and more in her delightful novel, The Memory of Lemon. This well-crafted novel starring entrepreneurial pastry chef Neely is as satisfying as a four course meal with a delicious dessert. You won’t want to put it down! I read The Cake Therapist last year and really enjoyed it so it was a no brainer for me when I was offered the chance to read The Memory of Lemon. In this installment we pick up where The Cake Therapist left off and continue to learn more about Claire "Neely" Davis. More specifically we learn more of the back story of her relationship with her estranged father. It was an enjoyable read and I look forward to the next installment! One thing I want to point out is that even though this is a second I read The Cake Therapist last year and really enjoyed it so it was a no brainer for me when I was offered the chance to read The Memory of Lemon. In this installment we pick up where The Cake Therapist left off and continue to learn more about Claire "Neely" Davis. More specifically we learn more of the back story of her relationship with her estranged father. It was an enjoyable read and I look forward to the next installment! One thing I want to point out is that even though this is a second book in a series it most definitely reads like a stand alone novel. You don't need to read The Cake Therapist in order to read this one; although I recommend you do because it was a good book! This review has been hidden because it contains spoilers. To view it, click here. i just found out i won this book june 14 2016. thanks goodreads, cant wait for it to arrive! just arrived and started it today june 22 which was really fast! she is a baker and can 'feel' what is right to make the person but the current bride to be is proving difficult . she figured out a way to make both the bride and her mother happy which wasnt easy. she is getting divorced but had signed a prenup and is afraid she is goi i just found out i won this book june 14 2016. thanks goodreads, cant wait for it to arrive! she is getting divorced but had signed a prenup and is afraid she is going to lose her business and is not allowed to date. Judith Fertig is a debut novelist and award-winning cookbook author. Flavor speaks to her in stories and recipes, whether for baking or barbecue. She resides in Overland Park, Kansas, which is not quite somewhere-over-the-rainbow, but close.